We have already created 2 pagination articles for PHP Developers and this one is the advanced version of pagination with “…” many readers requested me to make it with these dots, so today I am going to write this article on advance pagination with jQuery and show you how to show small list of numbers with dots in between. Database configuration file edit database name, user and password as per your configuration. Contain styles for your pagination numbers and next and previous. Your request via AJAX function sent to that php file and it will process the request and return you paginated data. This line of code return all numbers in the table and show count. It will show you 5 records on each page you can increase records and decrease by changing this value $start = ($page-1) * 5; to any number you want. Feel free to comment your suggestions and problems you are facing in regard this tutorial. You have to increase number of your total records in this query i counted number of records. for dummy you can do it like that $count = 200; on line number 6 in loadData.php. i tried to discover its arithmetic but i didn t find it so how can i modify it ? Have you changed $count = 200; field value to 20? This code is appallingly bad. There is no clear separation of concerns, the database functions being used have been deprecated and have far better and safer equivalents (PDO, for example) and the code is needlessly verbose and haphazard. It has all the hallmarks of an amateur developer’s code. Sure it’ll work but it is utterly unmaintainable. It is poor form to delete comments from people who point out the flaws in your articles. Address the issues like a grown up, or don’t open a forum for comments at all. @disqus_0kqNLfcZZj:disqus Thnks for your comment I am working on this feature and hopefully publish it very soon. Glad to hear from you sir, i would really love to see such feature in your upcoming post. Thanks for reply. hello sir i have used this code its work properly but when rewrite URL using .htaccesses i am faced problem. Can you pls. give an explanation re the constants that you used. For example, the number 4 in line 29 of loadData.php. Or the number 5 that is frequently appearing. Is it equal to the numbers of rows to be displayed. Thank you. i am getting following error message in “loadData.php” why ? Turn on errors reporting on loadData.php file then send me exact error which you are getting. how to turn on .. actually i am new to php. no sir, i am getting same message. The page cannot be displayed because an internal server error has occurred. ya… on the server side not localhost. I can’t Help you until you show me errors. i am sorry for the confusion. i have checked the code in online. there is no errors in the code. and i was testing it with a new table. now it is working very fine. anyway thanks for immediate reply. i would like say thanks for you and your website. for providing such scripts. it was great. thank you again. i want to display 10 results per page. 34567..910Next » like this depending upon the device width. There is a mistake in code I have fixed it no please download source code again and use it. I have added a variable $recordsPerPage = 5; change value of that variable to increase/decrease number of record per page. Ajax part of code is not working. Tell what to change for it. What error you are getting in it debug ajax in firebug and send me exact error. Im receiving this error: “Warning: mysqli_num_rows() expects parameter 1 to be mysqli_result, boolean given in C:Program Files (x86)ZendApache2htdocsokasloadData.php on line 102 No Data Found”. Weird because its the same query I have in line 4 and it works. i use a comment to check if the query in line 4 works and results were displayed, despite the fact that pagination appear but didnt work. any help appreciated. brgds! Make sure that you have a valid connection link in 1st parameter. thanks for the tutorial. It is woking fine…love your mailing list. Hi phpgang, it’s a nice tutorial. I was able to use it on my codes, but when I click the next page, it loads to blank page. I know it must be somethign to do with the AJAX. I tried to change the URL as well as the class and id, but when it loads, it goes to blank page. Help, please? Thanks! as i have drop down list with dependency serach of items. Why do you need the elseif part, just use else ? I’m trying this for a photo gallery so I’ve set the number of results to 1. How can I change the code to ONLY show <>? Your code is mixture of mysql and mysqli functions. Hello I am implementing it for a shopping cart and it works, only the detail is that it does not work with a search engine, that is, with a form that I have and send the data by post to the same index, any proposal? 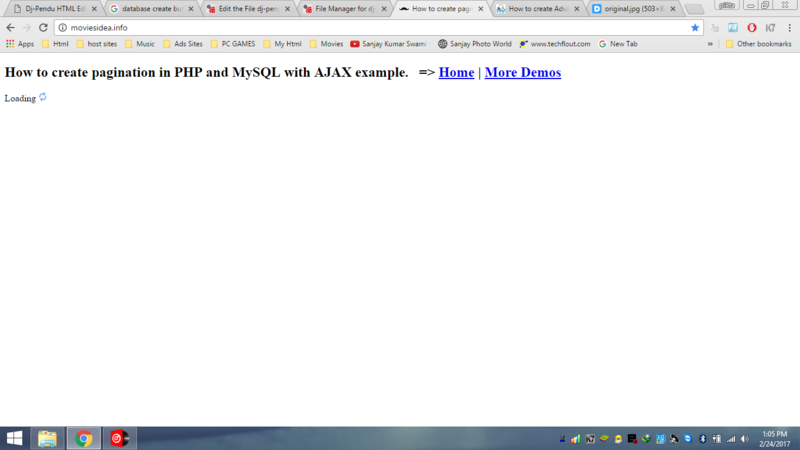 Hello Your PHP Pagination demo not Working . May be issue of database connectivity .